#419 Bell Buoy: Dog friendly cottage in unbeatable waterfront location with amazing views! 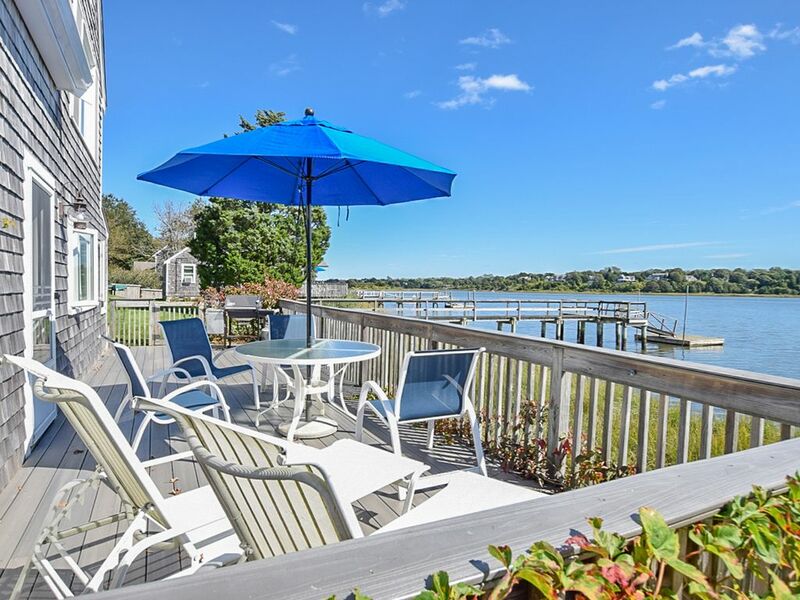 It is perched directly on the waterfront of the Anchorage On The Cove property with a large deck overlooking the ocean; with outdoor seating, an umbrella, and a propane grill, you'll be in the ideal spot to enjoy the all beautiful scenery! This cottage is truly on the water, and provides spectacular views from the master bedroom, living room, kitchen, and the outdoor living space. You'll certainly enjoy waking up to these breathtaking views and reveling in what Cape Cod has to offer. In addition to sleeping four permanent guests, this cottage also has a futon couch in the living room, so an additional guest or friend can spend the night. Our cottage is perfectly located on the Nauset cove and estuary. The large, gated deck is where you'll enjoy cocktails and grilling, watching boats in the bay, birds and beautiful sunrises and sunsets. Inside you'll find a galley kitchen with seating for four, two bedrooms, a queen bed in one and 2-twins in the other, and a gas fireplace in the living room. Stay cool and connected with A/C units in both bedrooms and secured wifi and satellite to enjoy on your flat screen TV. Anchorage on the Cove by Del Mar Vacations offers a full vacation experience in one place. Put your boat in at Town Cove and pick up your guests right at our boat dock for a day trip to anywhere! Enjoy use of our kayaks, canoe or skiff or bring your paddleboard or fishing poles to explore the area. We are centrally located near shopping, bay and ocean beaches, bike trails, art galleries, theatres, great restaurants, and the Cape Cod Institute and Cape Cod Symposia. Large Families Take Note! This unit is on a property with 3 other cottages and 2 condos that are also available. The entire property sleeps 23 and is fantastic for a large family offering plenty of open space as well as private space if needed. Pets are always welcome on leash and even have their own dog run on the property(just make sure to supervise and clean up after). Our waterfront accommodations are open year round, and our cottages are available on a weekly basis “in season” from Saturday to Saturday and off-season, we offer a two-night minimum. -Dogs w/approval and fee paid. On leash at all times. Crated when left alone. Luke, the owner of the Del Mar Vacations, grew up in Wellfleet, Massachusetts and is a true wash-ashore. Along with his wife Christina, and their daughter Grace he resides in Orleans in a restored antique farmhouse near Pleasant Bay. He started Del Mar Vacations to provide great service to homeowners and vacationers alike. Luke was tired of rental homes that lacked the basic necessities - he felt that guests should be looking forward to their relaxing vacation rather than worrying about packing enough sheets, towels, and other essentials. Everything we do at Del Mar is geared toward making your guest experience better than the status quo. We strive to provide guests with a memorable experience in private homes for a true Cape Cod vacation. My wife and I loved the location and layout of the cottage. The communication was superb, the cottage was clean and the bed was very comfy. Would definitely recommend if you’re in the area. Thank's for the recommendation, William! We are glad to hear you enjoy the cottage as much as we do! This is a great place to relax. Loved the fact that it is pet friendly was able to bring my babies with me. Met the owner while we were staying here and he was very friendly and gave us ideas of places to eat. The house was very clean and contained everything you need to feel at home. Looking forward to coming back again. Great property; loved having the dog with us, and the kayaks available. Very responsive management. Amazing location. We especially enjoyed the deck. Peaceful but still close to amenities.